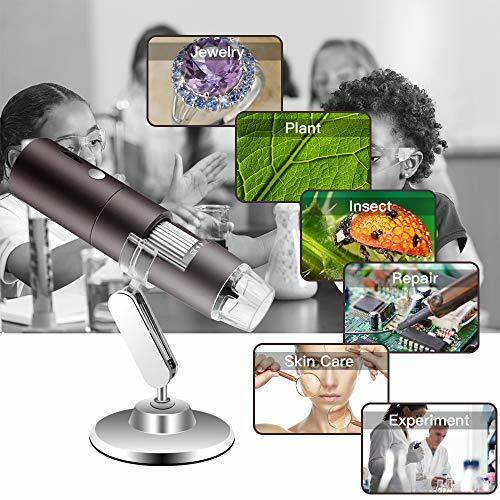 Let Our Wireless Digital Microscope Accompany You to Explore a Microscopic World ! Our usb Wifi microscope is a perfect gift for students or kids to spark their interest in learning and creative thinking. 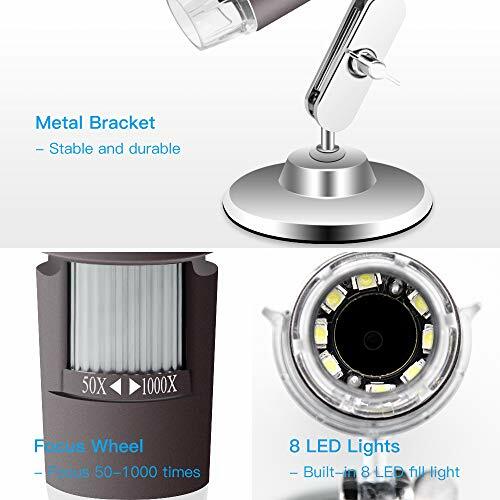 It is very easy to use by just download the app in your phone or tablet and connect it to wifi, built-in 900mAh rechargeable lithium battery that will offer you a long time continuous work about 3 hours to meet your need. It is lightweight, pocket sized and handheld design, very convenient for you to carry it outside for field observations without adding many more bulk. 1.Open the dust cover before use and close the dust cover after use. 2.If you need to observe microscopic words such as cells, make you own biological microscope slide and watch it on a mechanical stand. 3.Get objects approximately close to the microscope port if you rotate the knob to 1000X side. 4.For better focus, rotate the knob should be slowly when adjusts the zoom. HIGH PERFORMANCE: Support adjustable 50X to 1000X magnification, built-in 2.0 Megapixel CMOS sensor, support capture picture and record video with 1080P/720P/640P/480P, and provides a wireless working range of 33ft. 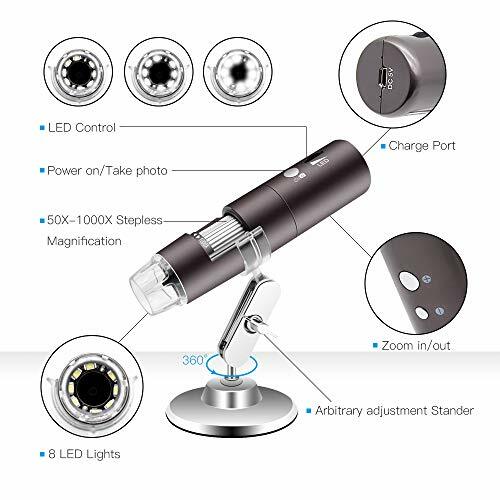 FEATURE 8 ADJUSTABLE LED LIGHT: Our wireless digital microscope features 8 led lights which allows you to adjust the brightness for enhanced detail and optimal viewing clarity when you are observing. 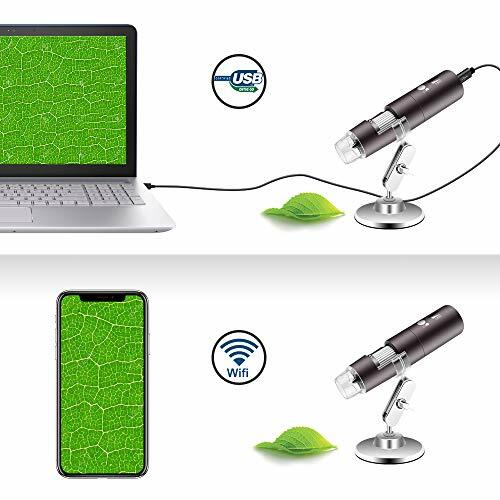 BUILT-IN 900mAh RECHARGEABLE BATTERY: Just take only about 2 hours to use a standard micro usb cable to charge this microscope full, and it can offer you a long time continuous work about 3 hours to meet your need. Plus, it is pocket sized, more convenient to carry it anywhere for observations. EASY TO USE: What you need to do is to download the APP and connect it to WiFi following the instructions, then start to view a microscopic world right on your phone, tablet or laptop. 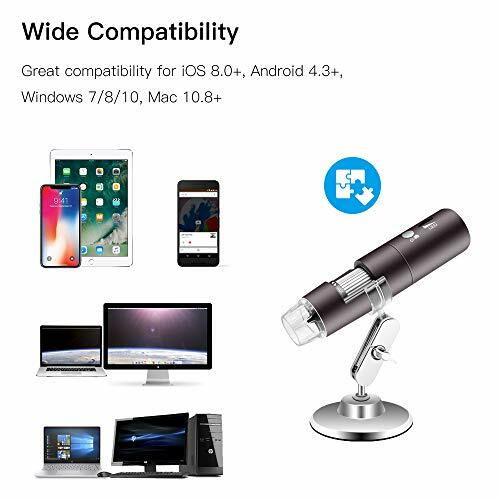 Compatible with Android 4.3, iOS 8.0, Windows vista/7/8/10, MacOS X 10.8 or later. 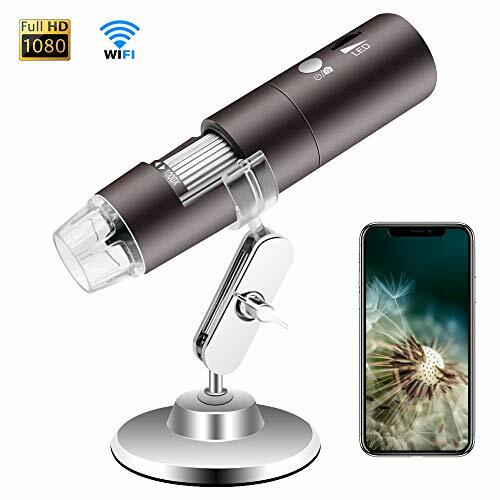 EXPLORE A MICROSCOPIC WORLD: Our usb Wifi microscope is a perfect gift for students or kids to spark their interest in learning and creative thinking, it is widely used to Inspection dissection/examination, Plant dissection/examination, Skin examination, Textile Inspection, Jewelry Inspection, Collections/Coin Inspection, Printing Inspection, PCB or PCBA Inspection and more.